Need to get results with UML…without unnecessary complexity or mind-numbing jargon? 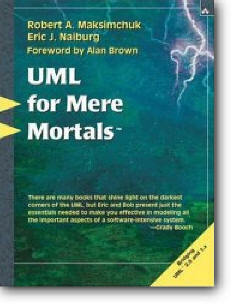 You need UML for Mere Mortals®. This easy-to-read introduction is perfect for technical professionals and business stakeholders alike: anyone who needs to create, understand, or review UML models, without becoming a hard-core modeler. There's nothing theoretical about this book. It explains UML in the context of your real-world challenges. It's organized around the activities you'll need to perform. It focuses on the UML elements you'll find most useful. And it offers specific answers for the problems you're most likely to face. Drawing on extensive experience, the authors offer pragmatic explanations and guidance on core techniques ranging from use cases to component diagrams, architectural patterns to application and database modeling. You'll find practical coverage for using UML to support testing, as well as discussion of UML 2.0 and its implications. Whether you're a manager, programmer, architect, database designer, or documentation specialist, UML for Mere Mortals is the handy resource you need to help you achieve your goals with UML…simply, quickly, painlessly.